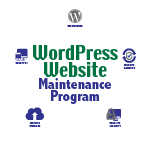 Are you making the most of your business’s WordPress website maintenance? A well-designed website can make or break today's new startup businesses. This is one idea all successful entrepreneurs can agree on. You need a robust, adaptable platform you can update with ease – a responsive website design that directs shoppers to purchase from you will help traffic flow right to the shopping cart. Abundant e-commerce solutions make transaction processing effortless. Before you know it, your company's online income will grow at a steady pace without any help from you. This is where today’s entrepreneurs want to be: making money without working hard for every single penny. And in an instant, one malicious hacker can take it all away like it was never there. On the other hand, many website crashes happen because website owners are just trying to install updates and upgrades. In other words, great website design is only half the battle of achieving online marketing success. Are you missing the site security and maintenance you need to keep your money-making machine humming? Websites crash and get hacked all day long. What plan do you have in place to prevent this from happening to you? All too often, we find the answer is "nothing." In response, MarketBlazer, Inc., developed a program that provides our clients with the security and routine maintenance their websites need to stay up and running. One of the most important aspects of our WordPress Website Maintenance Program is regularly scheduled backups to offsite, cloud-based storage. We start by booking weekly or monthly database backups to ensure your data and files are safe in the event of an attack or crash. Next, we schedule monthly or quarterly full backups to protect your plugins, images, and themes. All those backups stay on MarketBlazer's secure offsite cloud storage location. This offers an added layer of protection in the event of a website emergency. When your website crashes, storing your backups on the same server as your compromised website does you no good. The next layer of protection offered by the WordPress Website Maintenance Program is security support services. There are lots of basic security steps you can take to safeguard your website from intrusion. These tactics include limiting the number of failed login attempts to deter hackers and meddlers. We can set up alerts so that we know whenever any of your files change or if outside parties scan your website for vulnerability. Your home's alarm system has an "Away" setting for when you're not home. Your website can have something similar. Nobody's on their website around-the-clock and an easy way to track nefarious activity is to apply an "Away" setting to your site. We can even lock out bad users identified through these strategies and others. Throughout the last several turbulent years in the online marketing industry, our team at MarketBlazer, Inc., worked to develop a proven seven-step process to help our clients achieve their goals. We deliver the goods by building marketing systems that generate a steady stream of quality leads. We know how the online marketing process works. Our team can help your company surpass its goals. MarketBlazer firmly believes that online marketing can only be successful if we put strategy first. And if you are taking this seriously, website security must be a cornerstone of your online marketing plan. Our team can help you build a system that generates quality leads and a website that converts leads into sales. We can help you maintain and secure your online assets for continued online marketing success. Ready to give MarketBlazer’s proven marketing system and WordPress Website Maintenance Program a shot? Call us at 770-893-2443 to get started.